In the autumn of 2017, MHA-NYC was honored to have two of its dedicated staff members recognized for their significant contributions to our state and local communities. 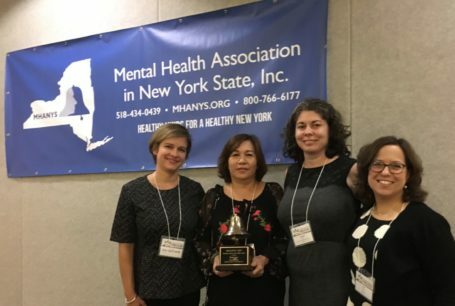 Rena Au, one of our Family Advocates from Manhattan South Family Resource Center, was awarded the 2017 Family Advocate of the Year Award from Mental Health Association in New York State! Rena has done extensive work to expand our services within the Chinese community living in Manhattan and Brooklyn. MHA-NYC staff joined Rena for the awards dinner in October 2017, where she gave a wonderful acceptance speech sharing her passion for mental health advocacy for families and youth. 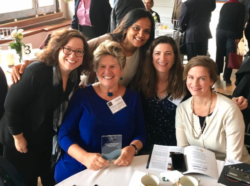 November 2017, NYN Media honored our own Kathryn Salisbury, Executive Vice President of Strategy and Business Development, as one of 50 of New York’s most prominent and accomplished leaders in human services, health care, education and other nonprofits over the age of 50. Chosen honorees are individuals who continue to make a positive impact on New York through their achievements, leadership, philanthropic efforts, and dedication to the betterment of the State. Congratulations to Rena and Kathryn for their exemplary work and dedication to the communities they serve. We are grateful for them and for all of our incredible staff here at MHA-NYC, who are changing lives every day. We would not be where we are without you, and we look forward to working with you in 2018!